Have you ever noticed how pain often leads us to change? Discomfort in life is what drives us to do something different. Like symptoms of illness show us something is wrong, so do our emotions, meltdowns, stress, anxiety, thought life, and unhappiness. They can show us that something isn’t quite right in the health of our everyday living. When I overbook my days (which I have a tendency to do) I find that I become detached from my close relationships, being critical of myself, stressed, and overwhelmed. The symptom: negative thoughts, anxiety, and not living my best. The cause: not honoring my capacity and my baseline needs. The solution: uphold my healthy state by taking care of myself! When you are experiencing discomfort emotionally, seeing your less-than-best self come out, and feel overwhelmed with life, take a look at your baseline needs! "Your baseline needs are the basic needs you must meet in order to function as your best self. Baseline needs are not luxury, they are necessary!" You cannot give from an empty cup! When you’re empty, you’re dry as a bone, you have nothing left to give. You already know this, so why don’t you do it? Because self-care can make us feel guilty. I know how self-care can feel: guilty, selfish, indulgent. Maybe beliefs come up to remind you that must put others before yourself or that you must be strong enough to not even need self -care! Both beliefs are rooted in fear. Drop the guilt, drop the fear. Start to honor yourself! I promise your life will change, your moods will change, even your relationships will change. The start to honoring yourself is to actually know what you need. How much alone time/friend time helps me thrive? What boundaries do I need to put in place? What do I need to feel like my healthy self? This isn’t extravagant stuff here, it’s practical. I’m talking sleep, food, working out, how you spend your time, conversations you have, and what you let your mind consume. Simply knowing what works and what doesn’t work is not enough; you must practice. Practice, have grace, and keep practicing. 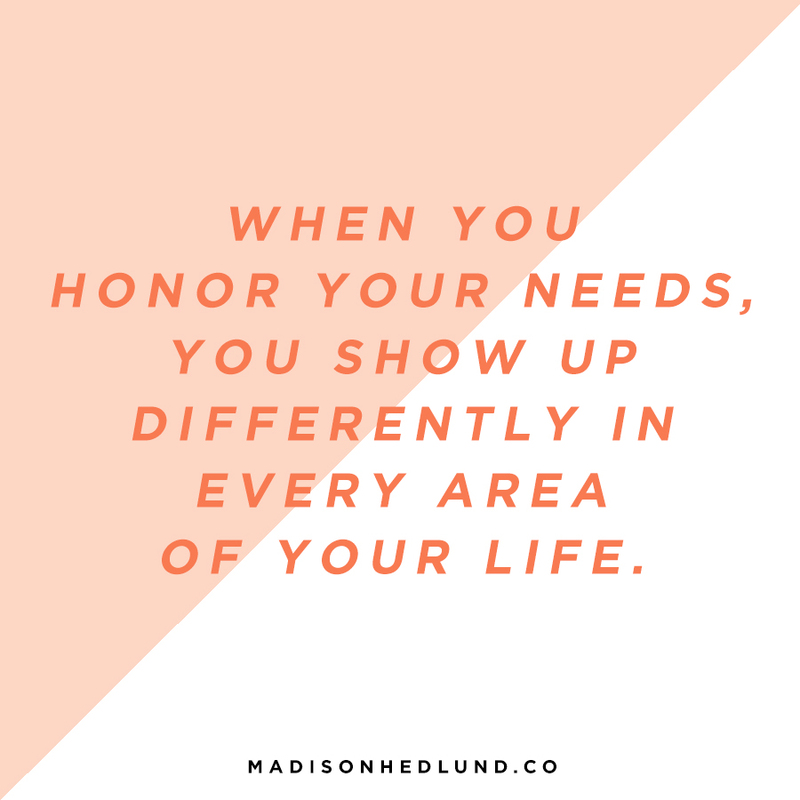 You’ll be surprised that when you start to honor yourself, you’ll show up differently in every area of your life. Honor yourself. Meet your baseline needs. I’m sending an email this week with a downloadable PDF to help you take your baseline needs a step further!